I’m pleased to announce that I’m contributing to a nifty website for Baby Boomers, Midlifers, People-of-a-Certain-Age, what have you. Boomeon is a new-ish online community for Baby Boomers and beyond. The site’s marketing director, Natalie Dewhirst, says that Boomeon wanted to create a supportive and safe environment where people can be student and teacher, author and reader, adventurer and observer. Boomeon has created a new section on creativity, and I’m thrilled to write the inaugural essay. “On Creative Writing and Curated Wisdom” was inspired by my recent stay in Provincetown, where I took a workshop with novelist and memoirist Dani Shapiro. Part II of the essay will appear on Boomeon in a couple of weeks. If you want to be sure not to miss it, please visit my profile page and click “Follow” at the bottom. I hope to see you there! And I’ll still check in here from time to time, although (as you might have noticed) I’m blogging less and writing more. That book’s not going to write itself, now is it? As always, thank you for your support…and for reading me! 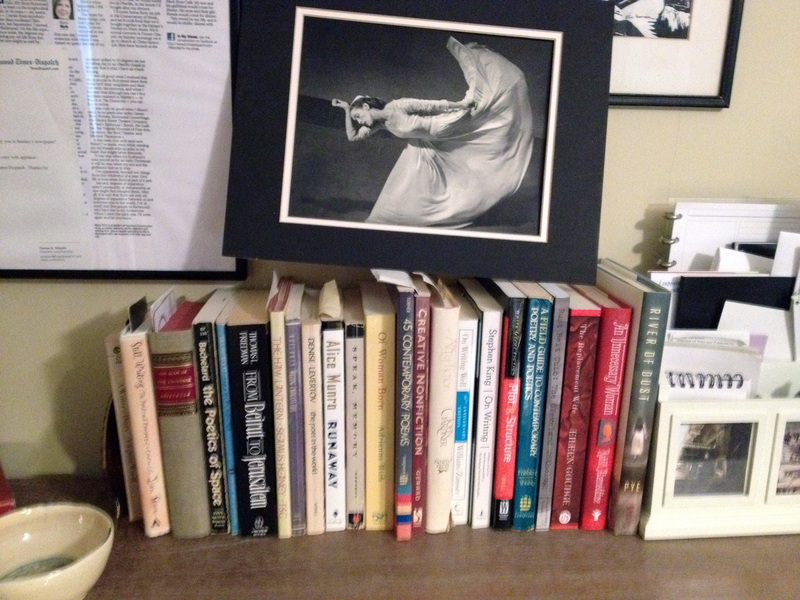 Dani Shapiro’s wonderful book, Still Writing (far left on my shelf), is always close at hand.